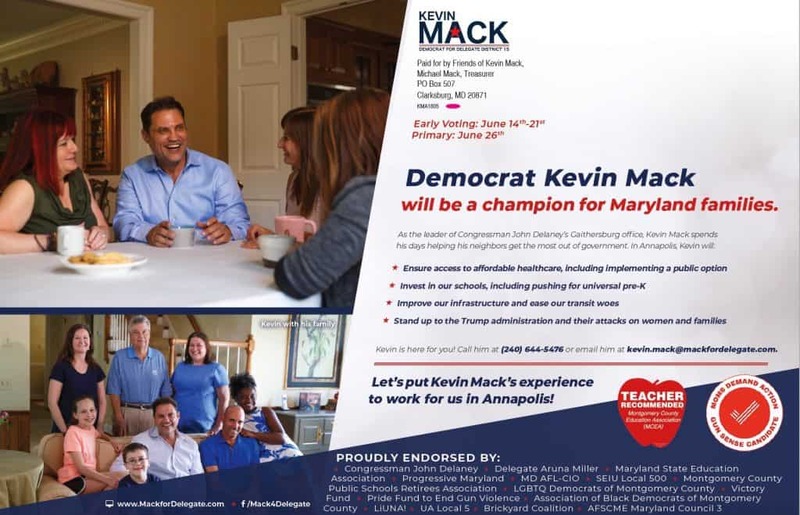 District 15 state delegate candidate Kevin Mack is releasing a campaign mailer touting Del. 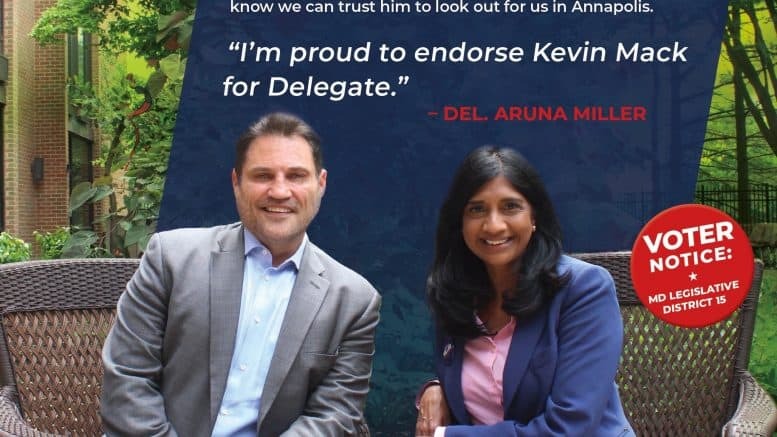 Aruna Miller’s (D-Darnestown) endorsement of his campaign. 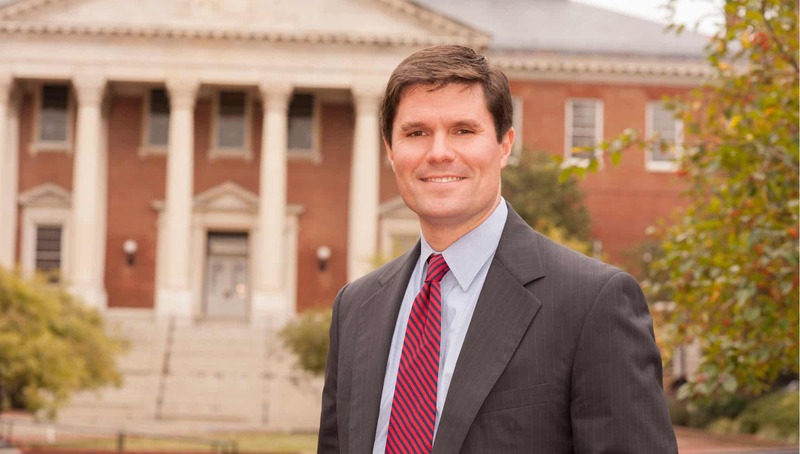 Miller is leaving the Maryland House of Delegates to run for Congress in the 6th Congressional District Democratic primary after nearly eight years serving in the three-person District 15 delegation. She was first elected to Maryland’s lower legislative chamber in 2010 and was re-elected in 2014. Miller is locked in an eight-person Democratic primary, with her top rivals being millionaire businessman David Trone, state Sen. Roger Manno (D-Silver Spring) and pediatrician Dr. Nadia Hashimi. Mack, who lives in North Potomac, serves as Rep. John Delaney’s (D-Md.) district director for Montgomery and Frederick counties. This is Mack’s first run for public office. In addition to Miller’s endorsement, Mack’s campaign is backed by a number of progressive groups, as well as his boss, Delaney, who is giving up his safe seat in Congress to run for the 2020 Democratic presidential nomination. Incumbent state Sen. Brian Feldman (D-Potomac) has formed a candidate slate with House incumbents Dels. Katheleen Dumais and David Fraiser-Hidalgo. Feldman, Dumais and Fraiser-Hidalgo are expected to win re-election without issue. The race to fill Miler’s seat is a seven-person contest that includes Anis Ahmed, Amy Frieder, Hamza Khan, Mack, Tony Puca, Lily Qi and Andrew Van Wye. Qi, according to most political insiders, has emerged as Mack’s top competition in the race, given the amount of money her campaign has raised, as well as the backing she’s received from outgoing Montgomery County Executive Ike Leggett, who is not running for re-election. While Miller is backing Mack to fill her seat in the District 15 delegation and Mack is backing Miller to succeed his boss in Congress, Miller’s chief Democratic primary rival, David Trone, is backing Qi over Mack and has contributed money to her campaign. Qi is also said to be backing Trone over Miller in the Democratic primary. Recent campaign finance reports show Mack having nearly $46.6K in the bank. His campaign told A Miner Detail that he is expected to raise additional funds leading up to the June 26th primary. Qi’s latest campaign finance report shows that she has a cash balance of nearly $78K, and Wan Wye, a former Capitol Hill intern and Senate reporter, has $30K on-hand. Hamza Khan still hasn’t filed his campaign finance report and is several days delinquent the May 22 midnight deadline. Khan told A Miner Detail that he intends to hold a few fundraisers before the June primary and will raise “significant money.” He also told A Miner Detail that his campaign treasurer was unable to file his campaign finance report by the May deadline because of Ramadan. Incumbent Del. Dumais’ campaign finance report lists a little over $32K in the bank. Fraser-Hidalgo’s latest report shows he has just shy of $40K. Early voting begins Thursday and extends until June 21. The primary is June 26.